The Layton Farmstead, situated at the intersection of Baileys Corner and Allaire Roads, functioned as a successful farming complex during the heyday of Wall Township’s agricultural industry in the 19th century. Adjacent to Layton’s property was Mrs. Bailey’s Inn and the Baileys Corner’s school, which was established in 1866 and enrolled more than 100 students by 1880. The blacksmith shop, mill house and other grain shops on Layton’s nearby farmstead most likely played an integral part in the development of the Baileys Corner settlement. None of these outbuildings exist today, but two houses remain to tell this property’s story. The Joseph Layton House is a two-and-one-half story vernacular frame, wooden clapboard-clad farmhouse constructed circa 1860. The house retains its historic massing, including a two-story cant bay window on the primary façade, and a one-story partial width wrap around porch. The porch has been completely boarded as have all the windows save two on the second story. The neighboring John Layton House is a two-story vernacular wood-frame farmhouse constructed circa 1880 closer to Baileys Corner Road. It measures six-by-two-bays and has a side gable asphalt shingle roof with a central open pediment on the primary façade. The house retains historic detailing, including exposed rafter tails at the cornice, gable ends and pediment and fish scale shingles within the pediment. The primary central entry is sheltered beneath a full-width, wraparound porch. The former agricultural fields surrounding the farmstead buildings have been largely preserved and converted into recreational fields, allowing a continued understanding of the dwellings’ historical context, despite the land’s new use. Joseph Layton established his expansive farmstead on Bailey’s Corner Road, at that time a major stagecoach route between Oceanport and Toms River, between 1860 and 1870. Joseph constructed a farmhouse (the Joseph Layton House), where he resided with his wife and eight children. By 1880, he had constructed a second house on the property, this one immediately adjacent to Bailey’s Corner Road, where Joseph’s oldest son John and his family lived. The property had been subdivided into two separate parcels and passed out of Layton’s hands by 1911, and was occupied by various individuals throughout the twentieth century. The Joseph Layton House property consistently served as a major farm in Wall Township, eventually becoming known as Green Top Farm. The property is still remembered locally for horseback riding and annual Easter egg hunts. Plans for a new Wall Township municipal complex were announced in 1976. Within the next twenty years, three large buildings were erected on the land just south of the Layton Farmstead along Allaire Road, including the Wall Township Public Library, police headquarters and a courthouse. By 1996, the most recent private owner was forced to sell Green Top Farm to Wall Township for the expansion of the municipal complex and the establishment of recreational fields. The remaining farm outbuildings were demolished, and soccer and football fields slowly surrounded the Joseph Layton House. In 2011, Wall Township acquired the John Layton House and property to the west of the new municipal fields with a $225,000 Monmouth County Open Space Grant, once again reuniting the two Layton farmhouses under the same owner. Today, both houses stand as dilapidated reminders of Old Wall Township. The police and fire departments currently use the Joseph Layton House for search and rescue training, abusing both the interior and exterior of the building. Wall Township has discussed several ways to reuse both buildings, but recently, the discussion has turned toward possible demolition of both properties in order to establish more recreational space, due to municipal financial constraints. 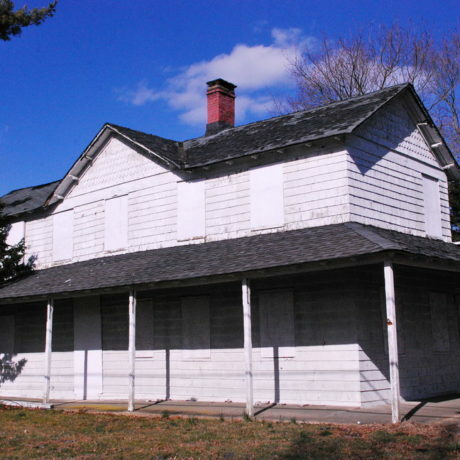 The Layton Farmstead is emblematic of thousands of historic buildings throughout New Jersey that are threatened by neglect at the hands of the public entities that own them. Preservation New Jersey recognizes the myriad of financial challenges that municipalities, counties, and our state government face, but believes that preservation of our shared cultural resources should be a public priority. Wall Township has made great strides in stewarding Camp Evans, a former Army base listed as one of New Jersey’s 10 Most Endangered Historic Places in 2002, partnering with volunteers to create the impressive InfoAge Science Center. PNJ encourages the municipality to look towards this success as inspiration for new uses for the remaining buildings of Layton Farmstead, one of a dwindling number of remnants of Wall Township’s equally significant agricultural past.